In Chinese medicine, eye diseases are closely related to a weakness in the liver and kidneys. If the liver and kidneys are weak, then vision will be affected. Of the twelve meridian channels, the stomach, heart, small intestine, urinary bladder, sanjiao, and gall bladder channels work to closely together to regulate eye health. If one or more of the channels are blocked or not functioning properly, people will notice eye disorders such as eye dryness, watery eyes, red eyes, even glaucoma and cataracts. People with cataracts are often told that there is nothing they can do to prevent the growth of cataracts. It is common for an individual to wait until the cataract is more progressed and then have it surgically removed. Chinese medicine can be used as a preventative measure and an alternative to surgery. 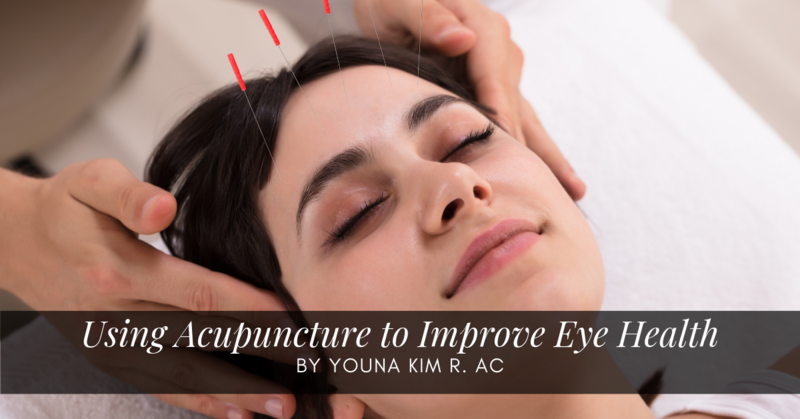 Acupuncture, for example, can increase Qi and blood circulation into the orbit of the eyes and nurture the eye system. There are a number of acupuncture points around the eyes that are important for eye health. Jingming (UB-1) lies where the inner corner of the eye meets the nose. Bladder 1 and 2 are perhaps the best two points for eye problems of all kinds, from early-stage cataracts or glaucoma to hysteria with vision loss. Zanzhu (UB-2) lies in the depressions at the inner ends of the eyebrows. Yuyao, midpoint of the eyebrow in the hollow. Good for eye problems related to anxiety, excessive study and mental strain. Tongziliao (GB 1) lies in the cavities on the outside corners of the eye sockets. Good for eye problems including conjunctivitis, red sore eyes, photophobia, dry and/or itchy eyes, early-stage cataracts and blurred vision, as well as lateral headaches. Chengqi (St 1) directly blow the pupil on the infraorbital ridge bone. This is a main point for all eye problems. GENTLY massage each acupuncture point around the orbit of the eye. This will help your eyes receive oxygen and nutrition that is needed for healing. 26 days agoby Youna Kim R.Ac.